The new Intecno micro gearmotors series characteristics: -	Coaxial arrangement of the input and output-	Compact design-	Advantageous torque with minimum space requirements-	Low moments of inertia-	Suitable for continuous, reversing and intermittent operation-	Can be installed in any mounting positionPlanetary gearboxes stand out for having a wide range of reduction ratios, four different pairings of sun gear and planets provide many ratios per gearbox stage. It is possible to obtain a total of 72 reduction ratios from i=3.7: 1 (1 stage) to i= 2076:1 (4 stages), not all reduction ratios are whole numbers. Planetary gearboxes are lubricated with grease and are therefore maintenance-free. This allows them to be installed practically in any location. Depending on constructive demands this product can be personalized due to the possibility of using metal, plastic or material mix versions. The LN (low noise) version is also available thanks to the helical toothing in the first gears which significantly lowers the gearbox noise. The distinguishing features of D.C. motors in general are their high start torque, which enables them to overcome heavy loads at start-up, as well as a torque/speed ratio suitable for high work loads and to absorb the kickbacks of a variable load. Another important characteristic of the D.C. motor is its density i.e. considerable power and torques are concentrated within a compact size compared to other types of electric motors. 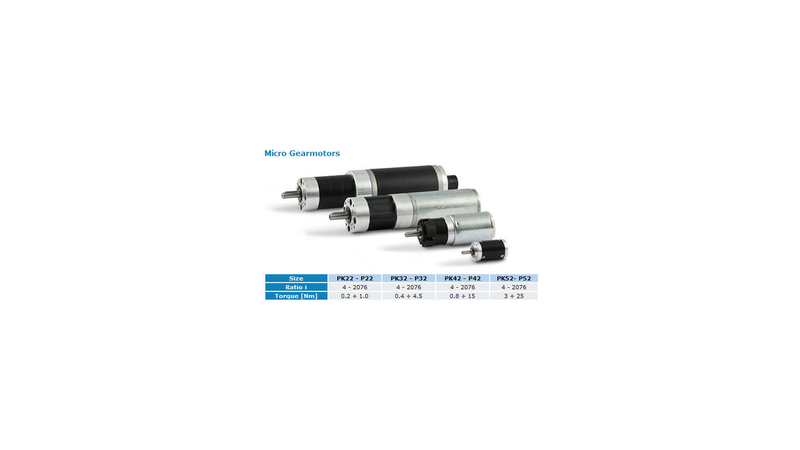 Features: -	Magnetic field generated by permanent magnets-	Available in 5 sizes: diameter 35,42, 52, 65, 80 mm-	Low voltage power supply, 12 or 24 Vdc-	Power ratings available from 8 to 140 W S2Intecno micro gearmotors are perfect for many applications, in any sector where both small dimensions and good performances are required. These characteristics are important in the medical sector, robotics and also in electric vehicles.